BRYAN EATON/Staff photo. Despite the unseasonably cold, windy and rainy weather, there is activity on the Newburyport Waterfront. 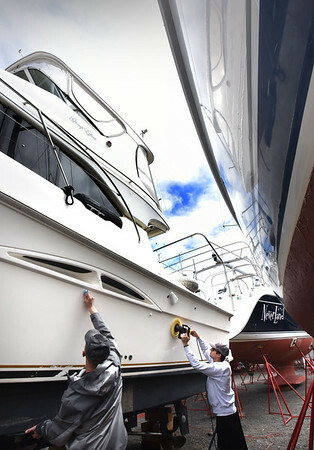 AJ Keating, left, of North Andover and Brett Kochanski of Newburyport spent Friday afternoon waxing and buffing a friend's boat at the Windward Yacht Yard. The 38' motorboat will be returned to the Merrimack River on Tuesday when the temperature is forecast to be more seasonal with the sun appearing.